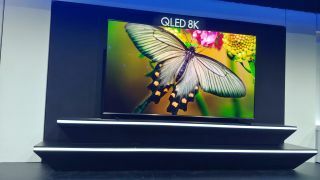 As if 85-inches of 8K TV wasn't enough, at CES 2019 Samsung has already outdone itself mere months after revealing its debut 8K OLED. It revealed a brand-new 8K Q900 QLED set, measuring in at a massive 98-inches. Sales of Samsung's screens over 75 inches have more than doubled over the last year in the US, and Samsung looks set to double down on super-sized screens to go with the next-generation of super-sized TV resolutions. The Samsung 98-inch Q900 QLED will once again take advantage of Quantum Dot screen tech, as well as making use of Direct Array Mobile Dimming, ensuring the contrast of a the screen is as rich as it can be for each scene. Yoon Lee, Senior Vice President Samsung Electronics America, said it will deliver "incredible color and contrast that others can't compete with." Ready to support HDMI 2.1, the forthcoming HDMI standard that can deliver adaptive framerates and advanced audio formats such as Dolby Atmos, the screen will also leverage the power of AI to upscale 4K content (and lower) to pristine 8K resolution. It uses thousands of individual algorithms to achieve this. In addition addition, Samsung's Bixby AI voice controller, working alongside other services such as Google Assistant and Amazon Alexa, will be able to control all manner of menu and TV guide options on screen, including jumping intelligently to whichever show you've been bingeing from Amazon Prime Video. Select sets from the new Q900 range will go up for pre-order today in the United States. While pricing has yet to be shared, those looking to buy into the latest Samsung has to offer won't have long to wait.